Waking up to the sound of waves sloshing against the shore during winter is almost the exact opposite of a pre-work February morning in the Blighty. No tip-toeing across icy laminate floors or trying to dry yourself on a damp towel. 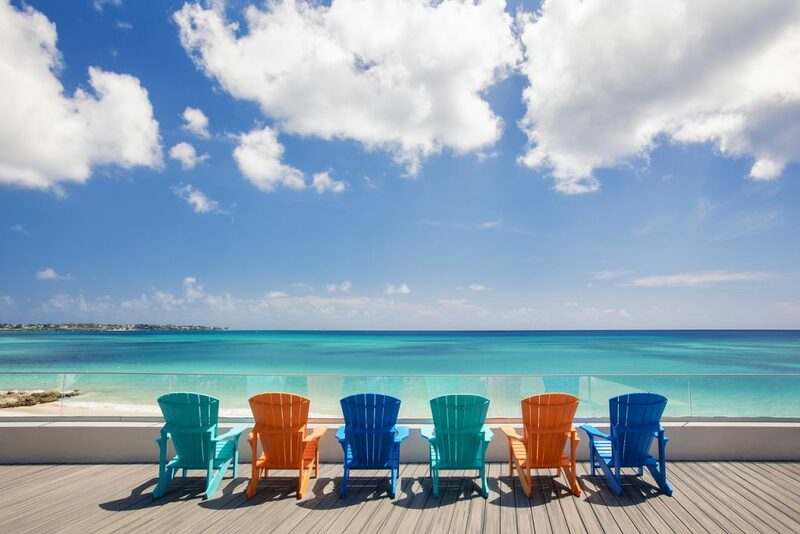 Winters in Barbados, as you’d expect, are made up of sunshine, ocean views, long breakfasts, cerulean skies and plenty of TLC. From December to February, the weather in Barbados averages around 29 degrees, making it the ideal spot for a winter escape. Not to mention how satisfying – and mildly sadistic – it feels to be slumped on a snow-white beach knowing your friends back in London are probably stood on the Northern Line. 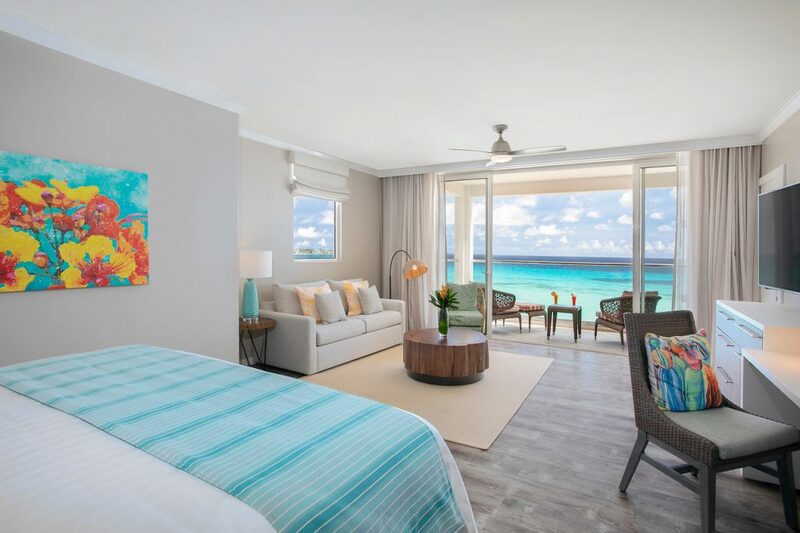 TLE recently visited Sea Breeze in Barbados, a contemporary all-inclusive resort on the South side of the Caribbean island, to see what all the fuss was about. Sea Breeze, as you could have probably guessed from its name, is lodged next to the ocean on the popular Caribbean island of Barbados. Arriving from the airport is relatively straightforward. Book a taxi in advance for around £18 or grab one out front for closer £30. The journey takes around 15 minutes, but make sure you agree on a price before setting off as taxis don’t have set meters. 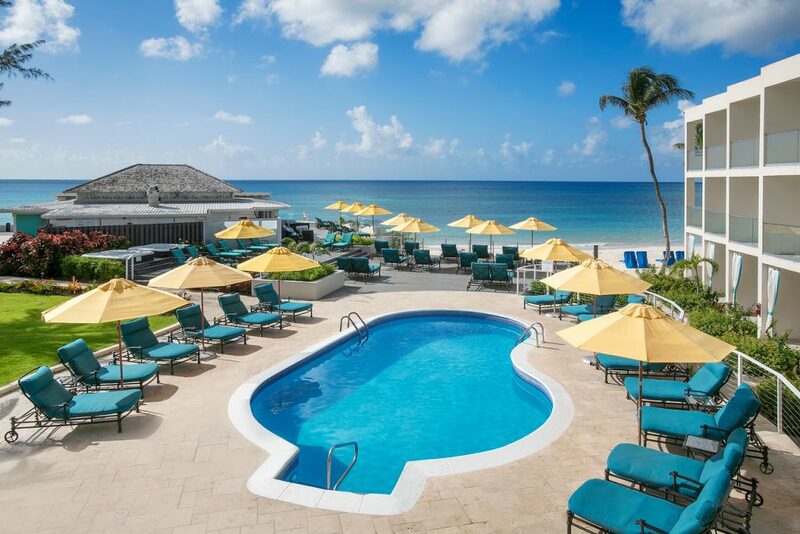 The hotel is located a twenty-minute walk (or five-minute taxi ride) from Oistins Fish Fry – the most famous fish market in Barbados. Those looking for a lively night should head to Oistins on Friday to sample authentic, local nightlife and taste some of the freshest fish on the island. Alternatively, jump in a cab to St Lawrence Gap – a trendy area packed with bars and restaurants – which is less than ten minutes away by taxi. Barbados’ capital of Bridgetown can be reached in 15-20 minutes by bus from a bus stop 30 yards or so from the hotel. Local services cost around £1 ($2 Barbados Dollars) regardless of where you’re going. Sea Breeze does not disappoint on comfort – its rooms are made for sleeping. King-size mattresses – almost as thick as the floor of a bouncy castle – and quality black-out curtains make it difficult to get out of bed in the morning. But once you’ve pulled your foggy rum-head from the pillow and drew back the curtains to reveal an ocean screaming ‘get in’, you’ll be ready to go. The hotel’s interior is contemporary with splashes of colourful, which occasionally comes in the shape of turquoise cushions and gaudy turtle canvasses. Rooms are luminous with the beachside suites located close enough to the sea that you could probably skim a stone from your balcony. And the bathrooms in junior suites are so they could be turned into single rooms. Each suite, there are 122 in total, has a flat screen television the size of Viking’s shield, a modern coffee machine and mini-bar with complimentary drinks – included in the room rate. Refreshments range from the easy-drinking local beer, Banks, to Coca Cola, rum and various juices. The staff at Sea Breeze are friendly and laidback, which is great but has its setbacks (you may wait a few hours to have your bed turned down). Although Marco and Alissa on the reception desk are the perfect mix of stress-free and helpful. The hotel’s atmosphere is friendly, non-pretentious and familiar. Guests ask one another “when did you get in?” and talk to staff like old friends. Sea Breeze caters mainly to couples and families and kids sure have plenty to do. As well as a choice of several swimming pools and a 300-yard beach, kayaks, footballs, snorkelling gear and regular exercise classes come free of charge. The hotel comes with five restaurants ranging from classic buffet-style, all-inclusive fare to slightly higher-end A La Carte cuisine. Food is hit-and-miss. The local food, like the slow cooked-beef stew and barbequed fish, is superb. But it seems that every good dish is followed by something distinctly average. That said the desserts (coconut sponge and custard being the star of the show) are stunning. 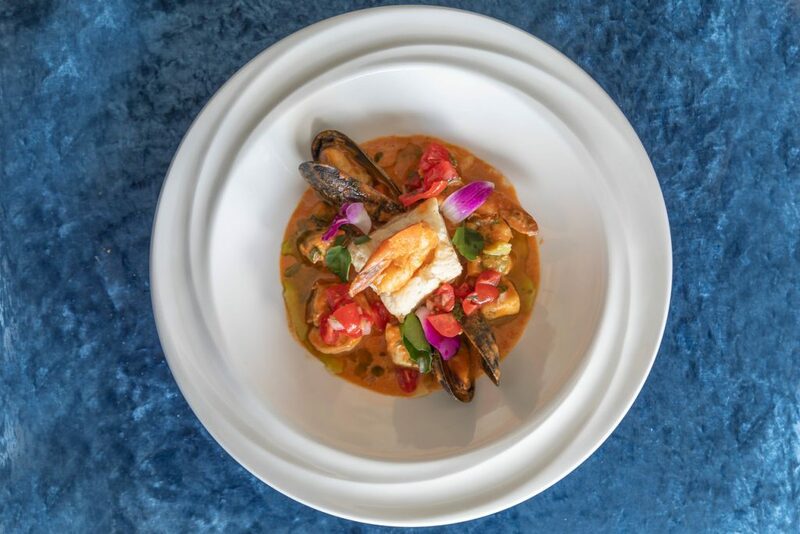 We’d recommend looking at the dinner menus over breakfast (served in Mahogany restaurant) then reserving a table to ensure the restaurant you want to go to is not booked-up. Get up early to make sure you don’t miss out. The hotel bars have a surprisingly wide-ranging drinks offering (though no drinks menu). 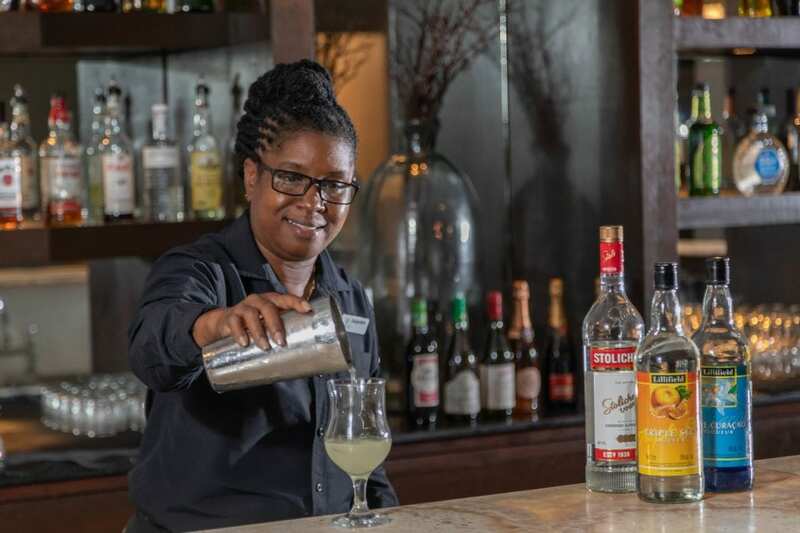 Local beers like Banks alongside Heineken are available as well as sparkling wine, various local rums and household branded spirits – rare in an all-inclusive resort. For stunning sea views ask to be placed in room 446, where every sense can be charmed by the nearby sea. Head down to the right-hand side of the beach (if you’re facing out to sea) to watch the sunset. Check out Oistins fish fry for some of the freshest, tastiest fish you’ll try in your life. Locals and tourists mingle around the many stalls offering everything from mahi-mahi and flying fish to macaroni pie (a Barbados gout-inducing take of macaroni cheese). Be careful late at night as there are some dubious-looking people selling things that aren’t always legal.